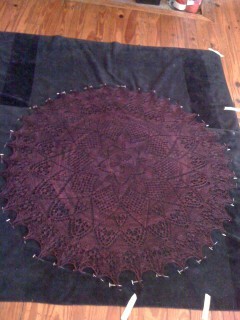 I finally blocked my Magenta Frosted Diamonds Lace Shawl. Unfortunately, my shawl was more of a rectangle than four sides of a pentagon like the schematic in Stephanie Japel’s Knitty.com pattern. Despite the slight deviation from the pattern, I decided not to re-block it. 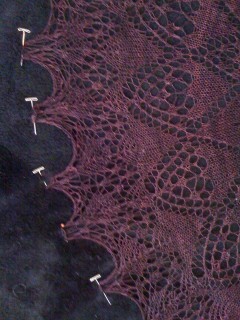 It took me a while to get the sides straightened out since I decided to forgo using my blocking wires. 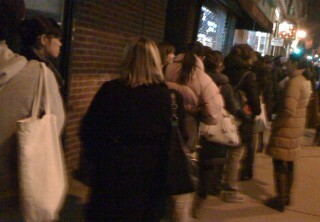 New York City knitters lined up outside the Lion Brand Studio to hear Shirley Paden introduce her new book, Knitwear Design Workshop. It’s a wonderful compendium that walks would be designers and knitters who want to learn about the design process to help them knit better fitting garments through her knitwear design process. Shirley Paden who made a career shift to being a knitwear designer gives readers insights into the craft. Shirley Paden wore an airy white lace mohair shawl based on traditional Shetland patterns over a basic black dress as she gave a visual tour of her garments through the years. What struck me was how generous she was to her students whose work now peppers the pages of Vogue Knitting and Interweave. Many of the knitters who helped her with this project were on hand and received warm applause to thank them for their work. 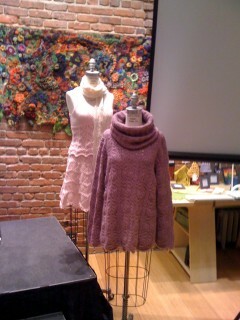 A few of the pieces in the book were on view and definitely not for the new knitter. While the book comes with a higher than average price tag, I’m sure that you’ll agree that this book is well worth adding to your knitting book collection. While I promised myself that I wouldn’t allow knitting UFOs to accumulate this year, the fact that my 40″ Hiya Hiya circular needles broke was a great excuse for starting a new project. I have wanted to make a lace shawl from the Madeline Tosh Lace Superwash Merino that I bought from Webs at Stitches East last November. The oxblood colored merino is a mix of black and purple that that any New Yorker could love. 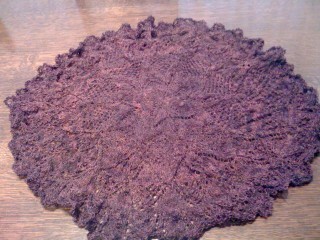 After going through various searches on Ravelry for knitted lace doilies, I decided to make the Mommes Lysedug. 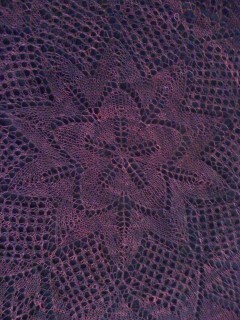 Several knitters made this antique lace knit doily into blankets. The free pattern translated from Danish contains 110 rows of verbal instructions although no charts. Based on the completed projects on Ravelry, I am guessing with my fingers crossed that the 950 yards of Madeline Tosh lace merino is sufficient to complete this wonderful doily. I test knitted a small swatch to determine the optimal size needles. 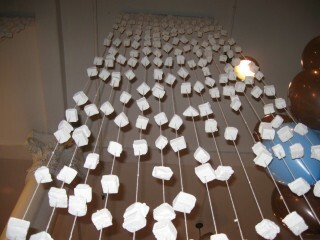 My goal was to ensure that the lace would stand out while allowing the piece to be as big as possible. I finally decided to use size 5 needles despite the fact that my size 5 double pointed needles were metal making them very slippery. My one concern was that Ravelers noted that the Madeline Tosh superwash lace weight merino springs back to its original shape. Since I’ve knit lots of shawls and scarves from superwash sock yarn, I have learned that wet blocking helps get the piece to show off the beauty of the lace. If the lace is only big enough to act like a lace collar that is fine with me. The Mommes Lysedug pattern is unusual in that it starts with 5 stitches which is a very small amount. After over an hour of playing with 5 stitches and 4 needles, I decided to start with 10 stitches since the pattern doubles the number of stitches in the second row. This worked like a charm for starting the pattern. PS: For more insights on the Oxblood Mommes Lysedug click here. 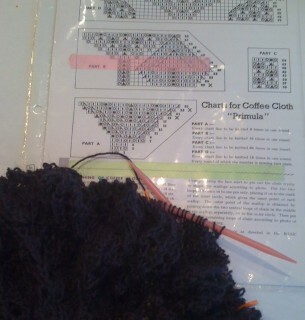 Knitting Needle Crisis – Hiya Hiya Circulars Break Mid-project! As readers of this blog know, I love knitting with circular knitting needles because the are easy to pack in your bag, keep the stitches in place, and don’t poke the person sitting next to you on the subway (where I do a lot of knitting). Unfortunately, if the circular needles break mid-project, you can have a big problem. This is the main reason that I stopped knitting with my set of interchangeable Densies; they kept coming apart midstream. 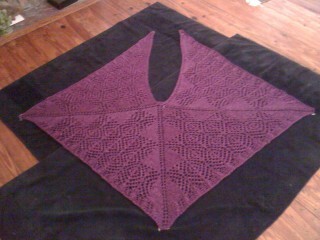 I have been working on the Delia Revontuli Shawl on my 40″ Hiya Hiyas. I bought them to make the mobius back in November. I selected the Hiya Hiyas since they didn’t contain nickel (to which I am allergic), they had good points, and they were about half the price of the Addis. When I take my project out of its bag, I realize that the metal needle is no longer attached to the plastic cord. 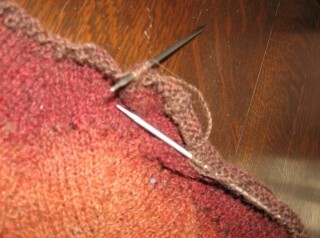 There is about 2 inches of shawl where there are live stitches floating in the air unmounted from the needle. 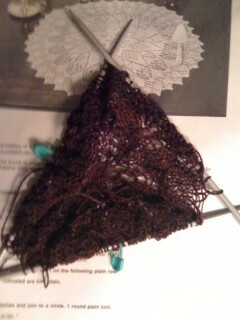 The only bright point to this situation is the fact that I am using Kauni which is a rough yarn that sticks to itself. While this makes it difficult to unravel, it is keeping my shawl in place. I am very disappointed because I liked the Hiya Hiya needles and I have only made three projects with these needles. I am going to contact Hiya Hiya and see whether they will make good and replace these needles. PS- I called Hiya Hiya and they said to send the needles back and they would replace them if they broke due to their fault. 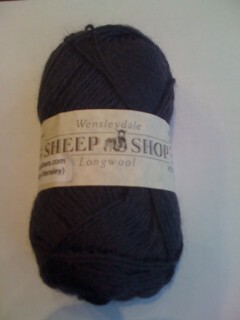 Of course, it will cost me to send them back and the broken needles have allowed me to move onto other projects. 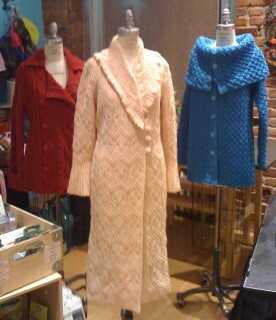 How can you go wrong with a combination of Knitting & Hot Chocolate? 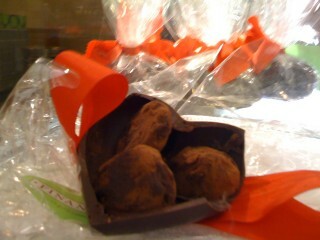 If you’re a knitting chocoholic, you don’t have to even ask. 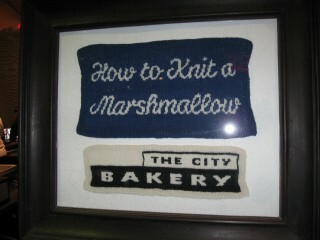 So when I heard about the City Bakery Night of Knitting and Hot Chocolate on Thursday, February 18th, I signed up right away. Not to be out done, a number of New York Yarn Stores offered mini-classes inspired by hot chocolate from marshmellow hats to cupholders. 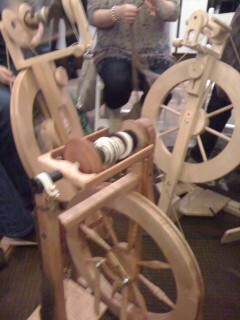 Participants could bring their own supplies or buy a small kit. 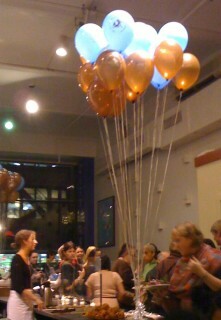 Since no party is complete without favors and this festivity was no exception. There were Knitty City totes filled with knitting goodies and chocolate chocolate chip cookies. 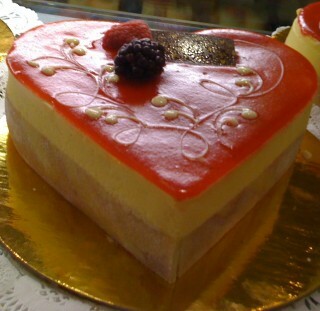 I couldn’t resist sharing a few edible valentine’s treats to celebrate the occasion. While it may not be as satisfying as eating them, it’s a LOT less calories! Having watched the 2006 Winter Knitting Olympics run by the Yarn Harlot and the 2008 Summer Ravelympics run by Ravelry, I considered joining this year’s Ravelympics. I really wanted to be part of a larger knitting community activity. Of late, I have been making (and finishing) smaller projects that can be completed in a couple of weeks such as smaller shawls and gaunlets. I thought that a small shawl like Bitterroot might make a good choice, especially since the pale teal Swan Island sock yarn that I bought last summer at Halcyon would be a perfect match. When I mentioned this to Mr. Husband, he objected which is unusual for him, especially when it comes to my knitting. His reasoning was that my knitting was an area of my life that was supposed to be stress free and participating in a time bound challenge, unlike a complex shawl or sweater pattern, would add stress where there shouldn’t be any. Since I am about one third of the way through my Frost Diamonds shawl based on my yarn usage and had to start my Ruched Neck Warmer earlier this week, I decided that he had a valid point. Therefore, I hope to finish these two small projects before the end of the Olympics. It’s my own non-competitive version of the Ravelympics. 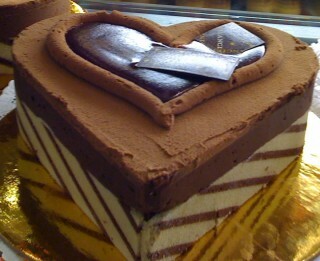 While it lacks some of the fanfare, it hopefully makes up for it with less stress. Watching the opening Olympics ceremony, I felt a bit wistful but, as I slowly added rows to my Magenta Frost Diamonds, I knew that it was the best thing for my peace of mind. I wish all of you who are participating the best of luck as I watch from the knitting sidelines as the games begin. Please leave me links in the comments if you want me to follow your progress.